After a long holidays, the Indian markets are opening today. The market has to begin a new April series today. It is expected to see some good upside in this series as this will be the month of companies' results. Since the companies are doing well in their performance as observed in last 2 quarters, this result will also be good as compared to the previous results. But since the market was down in March and the market capitalization is lost around 30-35% due to the bearish sentiment, this type of bearishness would continue, atleast for some days in this week. Today the Asian markets are down, it is expected that the Indian markets will open gap down. Some nervousness from political front will also add the negative sentiments till the political picture is clear. Traders are expected to watch the market careful and trade accordingly. Some midcap stocks will start picking momentum, especially consumer goods segments as this sector do good when the market sentiment is nervous. BSE and NSE have put a price band of 10 per cent on share movements of four firms – Essar Oil, Suzlon Energy, Educomp and CORE Education – as part of preventive surveillance measures. The price band will be applicable for trading in the four stocks with effect from April 2. The decision to limit any upward or downward movement in their share prices to a maximum of 10 per cent has been taken by the the stock exchanges in consultation with market regulator Sebi. In separate notices, NSE and BSE said that a fixed price band of 10 per cent on these four stocks is being imposed as part of a "preventive surveillance measure and to ensure market safety and safeguard the interest of the investors". The decision was taken in consultation with market regulator Securities and Exchange Board (Sebi), and the action will be reviewed periodically, they added. With an aim to prevent any systemic risks arising out of erroneous trades or stock manipulations, the market regulator Sebi late last year asked the stock exchanges to put in place a system for 'dynamic price bands'. These dynamic price bands, which are generally referred to as dummy filters or operating range, prevent acceptance of orders for execution that are placed beyond the price limits set by the stock exchanges. 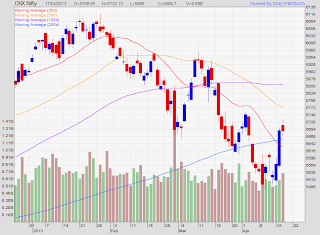 Today one can expect a good move in Nifty and Sensex after a good sell of on Tuesday. The whole day there were a lot of activities on political front and the outcome is clear that the Government has no fear of stability and Mulayam's Samajwadi party has come up to save the UPA Government. Also the Cyprus problem is also seemed to be resolved partly. The parliament of Cyprus has rejected the new proposed tax on bank deposit. These were the two important events which dragged the market in last two days and the market has come to a point where it should be bought and earlier the markets has seen a good recovery in these levels. 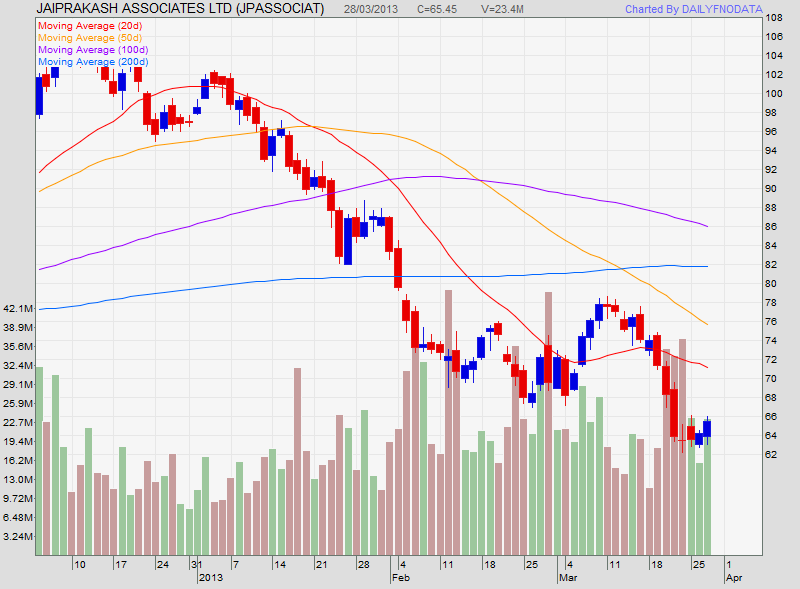 So again the market is ready to a good pull back and short covering can take the Nifty to 5800 levels soon. Once 5800 is reached, and how the things are, the next move of Nifty will be decided. Asia stocks moved higher Tuesday to take back some losses made the previous day, when investors reacted to news that a bailout for Cyprus would include a tax on bank deposits. Japan’s Nikkei Stock Average rose 2%, South Korea’s Kospi advanced 0.6%, and Australia’s S&P/ASX 200 index rose 0.5%. Hong Kong’s Hang Seng Index also ticked up 0.5%, while the Shanghai Composite index advanced 0.3%. Monday’s market action saw U.S. stocks fall but then creep back to end well off session lows. Earlier in the global day, Asian investors had suffered deep losses on news that Cyprus planned a one-off tax on bank deposits as part of a 10 billion euro ($12.9 billion) bailout deal, agreed with international creditors. “Markets look a bit calmer as the panic following the news of levy of bank deposits in Cyprus as part of a €10 billion bailout for the country, eased,” Crédit Agricole’s Asia head of global market research Mitul Kotecha said of Tuesday’s early stock action. “There’s no sign of bank runs elsewhere in the euro zone, and the go-ahead to make the deposit levy more progressive while maintaining the total amount at around ­€5.8 billion has helped to calm tensions,” said Kotecha. Favourable demographics and growth opportunities keep India an "attractive" destination for merger and acquisition activities across diverse sectors including consumer goods and pharmaceuticals, according to global consultancy Ernst & Young. "Catering to a growing, expanding and spending population is what every organisation wants to do. So there is a lot of interest from outside India to come inbound," E&Y Global Vice Chair (Transaction Advisory Services) Phillipa McCrostie told PTI in an interview. "I don't think India's growth is based on one factor or bubble that has evaporated and gone away. It is exciting time in India for M&A growth," she said. MUMBAI: India's largest real estate firm DLF and companies belonging to the Reliance Group led by Reliance Communications (RCOM) topped a list of local firms whose market value has eroded the most over the last five years in a sharp slide from of the peak of 2008. And the reason? Over-leveraging, changes in government policies, aggressive overseas acquisitions and governance issues. Jindal Steel and Power Ltd (JSPL) is going ahead with the Rs 30,000-crore, 6-million-tonne steel and power project at Angul in Odisha despite not having access to iron ore mines. The Naveen Jindal company will complete setting up a 1.8-million-tonne (mt) capacity in the first phase in the next 3-4 months. Orders to build the next phase of 4mt capacity are also in place. “We do not want to commit investment unless absolutely sure about mines in our steel and power projects. However, in Odisha, it is not the case,” Ravi Uppal, managing director of JSPL, said. Click here to see the EOD Chart of Jindal Steel and Power Ltd.
To grow its overseas presence Hero MotoCorp managing director and chief executive officer Pawan Munjal has said that upon gaining the requisite volumes the company would set up assembly plants in Kenya, Nigeria, Columbia and Bangladesh. “I am looking at setting up hubs to grow footprint globally. The company is looking at setting up assembly bases in Kenya, Nigeria, Columbia and Brazil over time to meet demand in Africa and Latin America," Munjal had said. Bajaj Auto with exports of 1.2 million units till February this fiscal is the largest exporter of two-wheelers from India. Auto major Maruti Suzuki has decided to suspend production of cars at its Gurgaon and Manesar plants on Saturday, a company spokesperson said. Amid declining sales, Maruti Suzuki India Ltd. (MSIL) has stopped production on Saturday to keep on hold production of petrol and diesel cars in all five units of its Gurgaon and Manesar plants for a day. On March 8 too, MSIL suspended production of petrol cars at three units of the Gurgaon plant. "To manage the stock, we have decided to suspend production of cars at Gurgaon and Manesar plants for a day. In future too, according to market demands, we may hold production," the company spokesperson said on Friday. CLSA has upgraded Sun Pharma from hold to Buy. The brokerage has also raised the price target from Rs 855 earlier to Rs 990. It also expects the business to see ramp up on URL, Taro and niche launches. CLSA has raised FY14/15 earnings forecast by 12-18 per cent on improved US market prospects. The brokerage firm expects 19.6 per cent core earnings growth over FY13-15. The Hajigak blocks are estimated to have reserves of around 1.28 billion tonnes of high-grade magnetite ore.
SAIL would be the major beneficiary if it is done. The meeting is to be held on 20th March, 2013. NEW DELHI: Reliance Globalcom, an arm of Reliance Communications, has upgraded the capacity of its undersea cable system that will address the growing global bandwidth demand for cloud computing, video and other high-bandwidth services. The company has upgraded its Trans-Atlantic FA-1 South submarine network with Ciena Corporation's GeoMesh solution, which will serve New York to Paris trans-Atlantic corridor. A total of Rs. 29,209.78 crores and Rs. 8,654.06 crores have been invested through Foreign Direct Investment (FDI) equity between 2009-12 in telecommunications and information & broadcasting sectors according to a report released by the government of India. Rs 386.55 crores was invested as FDI between April – December 2012 as compared to Rs. 9,011.53 crores between 2011-12 and Rs. 7,542.04 crores invested between 2010-11 according to the report. It is worth noting that in February 2012, the government wanted the 100% cap on FDI in telecom tower companies to be cut to 74% in par with other telecom services. Rs 1,162.26 crores was invested as FDI in the information & broadcasting sector between April-December 2012 as compared to Rs. 3,264.09 between 2011-2012 and Rs. 1,887.17 between 2010-11. The first meeting of the Government constituted committee to clear the prevailing ambiguity on FDI and FII has been convened on March 19. The four-member panel headed by Economic Affairs Secretary Arvind Mayaram will meet here to discuss how the Budget announcement on this issue can be taken forward and implemented. The panel report is expected in the next 2-3 months. Finance Minister P. Chidambaram had in Budget 2013-14 announced the Government’s intent to follow international practice in deciding what constitutes foreign direct investment and what constitutes foreign institutional investment. The Government proposes to lay down a broad principle that where an investor has a stake of 10 per cent or less in a company, it will be treated as FII. In cases where the investors have a stake of more than 10 per cent, it will be treated as FDI. Besides Mayaram, the four-member panel comprises Department for Industrial Policy and Promotion Secretary, a Reserve Bank of India Deputy Governor and a SEBI whole-time member. As per the news published in Business Starndard, Major industrial players from the state have got relief from the Gujarat High Court which has held that the Green Cess Act, 2011, enacted to generate funds to promote clean energy, was unconstitutional and declared it as void. In a recent decision a division bench of chief justice Bhaskar Bhattacharya and justice J B Pardiwala also issued direction to the state government to refund the cess already collected from the industrial units preferably within four months from the date of receipt of court order copy with simple interest of 8 per cent. The Act came into force from 2011-12, where by the government aimed to generate funds to promote clean energy by introducing a Green Cess on every unit of conventional electricity generated in Gujarat. Under the Gujarat Green Cess Act, 2011, Green Cess not exceeding twenty paise per unit was levyed on generation of electricity other than renewable energy for creation of a, fund (Green Envergy Fund) for protecting environment and promoting the generation of electricity through renewable sources in the state of Gujarat. This would also include electricity generated by captive power plants of companies. Major industrial players of the state had filed petitions in the High Court last year challenging the constitutional validity of the government's move of collecting cess on every unit of electricity generated in the state. The companies who had challenged the provisions of the act included, Essar Power, Nirma Ltd, Reliance Industries, Tata Chemicals Ltd, Arvind Ltd, Phillips Carbon Black Ltd and United Phosphorpus Ltd. The industrial players had contended that the Act provides for levy and collection of cess on generation of electricity, which is exclusively the Union subject contained in Entry 84 to List I of Seventh Schedule. The state government therefore has no competence to enact any law pertaining to such subject, they further claimed. The companies relied upon 2004 judgement in the Supreme Court case of M P Cement Manufacturers' Association vs State of Madhya Pradesh, wherein it was held that a State was not competent to levy cess as the Parliament had exclusive legislative competence in this respect by virtue of Entry 84 in List I of Schedule 7 of the Constitution of India. It was also held by the court that electricity was "goods" and that the State would have competence to levy tax on the sale and consumption of electricity but could not levy cess on the production of electricity. The government on its part argued that what is being charged under the act is a fee and not a tax. It further claimed that such cess is collected not for generation of electricity but is merely computed in terms of generation of electricity. It also justified its competency in levying such cess on the companies. After hearing the petitioner companies and the respondent state government the judges concluded "the State Act ultra vires the Constitution and the same is therefore, declared void. Resultantly, the Cess levied under the State Act would also stand vitiated." Apollo has introduced a new Steer Axle tyre ‘XMR’ in cross ply construction, which is designed for superior mileage and structural durability to deliver best cost of ownership in terms of ‘Total Mileage’; and the total mileage is derived from Initial Tread Mileage (ITM) and Retreaded Tyre Mileage (RTM). Every step in the creation of the ‘XMR’ is new with highest levels of precision, from the way it was prototyped, manufactured and validated in indoor and outdoor. Tread rib pattern and groove were designed and optimised using ‘thermography’ techniques for the tyre to remain cooler while running and thus extend casing life for multiple retreads. Design considerations were also given for uniform ‘foot pressure distribution’ and to nullify ‘hot spot’ on the ‘tread rib’ & ‘rib groove’ to benefit uniform wear & part worn appearance which are important parameters to decide on timely removal for retreading. The steer position is the most critical on any HCV and the tyre used on its steer axle position demands highest design precision and manufacturing controls. The service demand from steer tyre is growing exponentially due to developments in vehicle technology and infrastructure improvements compounded by radialisation in drive tyres. Andhra Bank and State Bank of Hyderabad (SBH), the two Hyderabad-headquartered public sector lenders, have promised to provide timely and adequate credit to small and medium enterprises (SMEs) at a bankers conclave held here on Saturday. SBH has gone a step ahead and declared 2003-14 as the SME year and offered to bring down interest rates to the small businesses. "We will target 60 per cent growth in the SME portfolio next year," said M Bhagavantha Rao, managing director of SBH, while addressing the seminar. The bank has already brought down the interest rates to SMEs under seven sectors to 11.75 per cent, he said while stating that the management is considering similar relief to more sectors in this bracket. Andhra Bank chairman and managing director BA Prabhakar said the bank's SME lending this year is expected to post a 25 per cent growth and the sector would continue to be a priority area in the future as well. "We are pushing more credit to the SME sector also because the large corporates have not been able to absorb the credit," he said. Andhra Bank lending to the SME sector stands at Rs 14,000 crore, which constitutes 20 per cent of the total loan portfolio of the bank, according to him. See Live Chart of Andhra Bank. See EOD Analysis of Andhra Bank. The public sector lender, Allahabad bank has cut its interest rates on home loan rates for non-resident Indian and person of Indian origin (NRI/PIO) as a part of its festival bonanza offer. The rate cut would be applicable on housing loans in the range of Rs 30-75 lakh, Allahabad bank said in a statement. The interest rate on such loans would be 10.25 per cent and the festive rates would be effective till March 31, 2013. Earlier, the bank had launched festival schemes for home loans under- All Bank Aashiana Housing Loan scheme in September, 2012. Under this scheme, the bank has offered concessions in interest rate and processing fees. The Hindu reported that Encore Cement and Additives Pvt Ltd a wholly owned subsidiary of ACC Ltd has been amalgamated with the company. The company has a slag grinding unit in Vishakapatnam in Andhra Pradesh. Consequently this unit now renamed Vizag Cement Works would be the 18th cement plant in the ACC network. In January 2010 ACC had acquired a 100% stake in the equity of Encore Cements and Additives Pvt Ltd which then became a wholly owned subsidiary of ACC. The acquisition helped ACC build its presence in Andhra Pradesh and in the coastal part of neighbouring Orissa. The amalgamation of Encore Cements and Additives into ACC Ltd would enable that latter to utilise the resources of its former subsidiary to augment its cement business and to bring down the cost of overheads and other common expenses. See Live Chart of ACC Ltd. See EOD Analysis of ACC Ltd.